Former President George H.W. 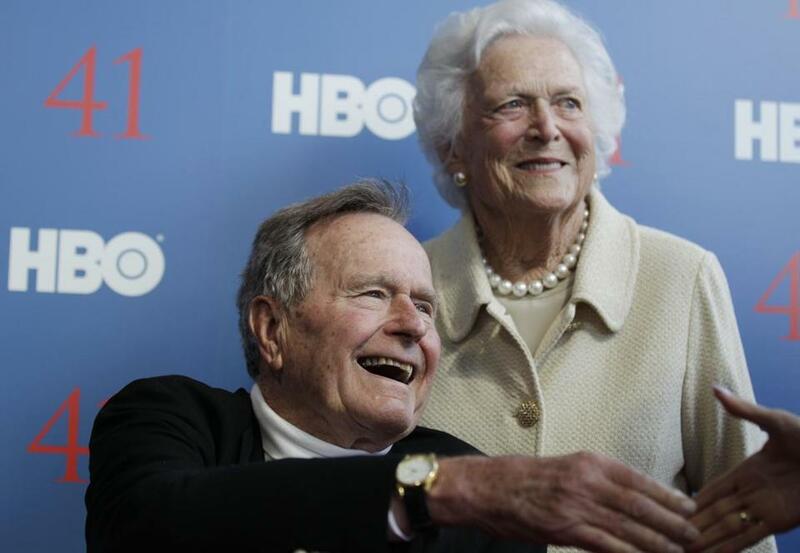 Bush, and his wife, former first lady Barbara Bush. With the wall-to-wall 24-hour news coverage of the 2016 presidential campaign — a.k.a. “what will Donald Trump do next” — important political stories tend to fall through the cracks. Case in point: word this week that former president George H.W. Bush will vote for Hillary Clinton for president. Still, for a former Republican president, the father of a two-term Republican president, the son of a Republican senator, and Ronald Reagan’s vice president, to vote for a Democratic candidate for president is extraordinary. In some ways, it is the clearest possible example not just of the havoc that Trump has wreaked within the GOP, but also of the party’s seismic shift to the right in the 25 years since Bush was president. Bush was no shrinking violet when it came to politics. His successful 1988 presidential campaign was defined by Willie Horton, the Pledge of Allegiance, and labeling his opponent, Michael Dukakis, as soft on crime, feckless on national security, and a card-carrying member of the ACLU. But while Bush played the part of sounding like a conservative, he was at heart a moderate Republican, not just in his politics, but in his demeanor. When he served as a congressman from Texas, in the mid-1960s, he supported housing integration — a move that outraged many of his constituents. When he ran for president in 1980, he blasted Reagan, calling his proposals for tax cuts and spending increases “voodoo economics.” He was an internationalist and foreign policy realist at a time when the party’s neoconservative wing was making ideological inroads. Bush, however, was on the wrong side of the GOP’s ideological fence, and so, like countless moderate Republicans, he went along to get long. A longtime supporter abortion, he changed his position when asked to become Reagan’s running mate in 1980 and put aside his opposition to Reagan’s economic policies. As president, he had some of his greatest battles with conservatives like Representative Newt Gingrich, particularly after he agreed to raise taxes in 1990 to reduce the deficit (a move that went against his “no new taxes” pledge in 1988). In 1992, he fought back a primary challenge from conservative commentator Pat Buchanan but ultimately lost reelection. To be sure, there’s no great need to romanticize Bush’s moderation. Although Bush might have been more inclined to use dog whistles in 1988 — while Trump uses actual whistles today — he certainly laid the groundwork for the kind of racially charged, delegitimizing politics that are Trump’s bread and butter. Still Bush is the polar opposite of not only the vulgarity and crudeness of Trump, but of the ideological dogmatism of the modern Republican Party. Politicians like Bush haven’t had much of a place in the GOP for decades — and his decision to vote for Clinton is further confirmation of the extent to which once moderate, pragmatic, and tolerant Republicans have no place in a modern Republican Party defined by nativism, xenophobia, and anger. But it’s also a reminder of just how abnormal a politician Trump truly is and of the unprecedented nature of his nomination. Bush might have had his issues with the rightward shift of the party, but no one can say the man is not a loyal Republican. This, after all, was a man who took on the job of RNC chairman during Watergate and traveled the country defending Richard Nixon. That even in his twilight years he would turn his back on the party in which members of his family have served for more than seven decades is the best possible example of the long-term damage that Trump is doing to the GOP. If George H.W Bush has no home in Trump’s GOP, there is no hope for the Republican Party.